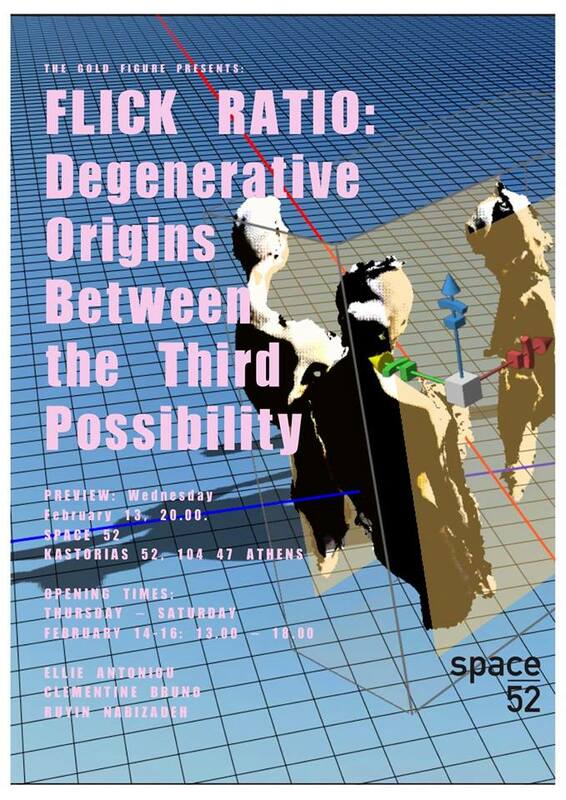 exhibition of the collective’s series titled FLICK RATIO: Degenerative Origins Between the Third Possibility, where the artists Ellie Antoniou, Ruyin Nabizadeh and Clementine Bruno will present new works discussing the degeneration of origins in a dialogue open beyond its own possibilities. We very much look forward to welcoming you at the opening night on Wednesday, February 13th, at 8pm. On Wednesday Ellie Anontiou will present a live performance performed by the dancers Xenia Stathouli, Xenia Tabourlou Iraklis Kotsarinis and Periklis Skordilis, in collaboration with Antonia Economo. All Welcome!